Thank you to Faye for sending this lovely sheep enjoying the photo below through, it’s definitely striking a pose! 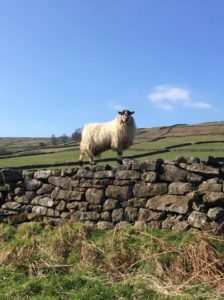 Sheep are a common sight on the North York Moors and unbeknown to lots of visitors to the area the sheep will help keep them safe from the risk of ticks when out walking. Most tick bites happen in late spring, early summer and autumn this is because these are the times of year when most people take part in outdoor activities, such as hiking and camping. Ticks can be found in any areas where there is deep or overgrown vegetation and where there is access to animals for them to feed on. 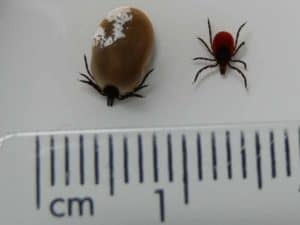 Ticks don’t fly or jump but they climb onto your skin or clothes if you brush against something that they’re on, they then bite into the skin and start to feed on your blood. There are many ways of reducing the risk of getting bitten, the main ones are to keep to designated footpaths, keep any dogs on a lead and wear lighter coloured clothing as the ticks will then be more visible. Moorland estates try to reduce the risk of ticks by having a good flock of sheep on the moors as the sheep act as “tick mops”. The sheep are dipped in a pesticide that attracts ticks and kills them off in huge numbers, and this has been welcomed as an effective and harmless method in the fight against ticks. For more details on ticks and Lyme Disease please visit the Lyme Disease Action Organisation at the link below, they have a massively informative website with all areas covered. The 2nd photo shows the before feeding and also the engorged tick after feeding.